Obama: "Today we continue a never-ending journey"
In the second and final inaugural address of his presidency, President Obama today called on Americans to fulfill the "promise" of American democracy, pursuing age-old Constitutional values while adapting to the realities of the modern age. Standing before a crowd of hundreds of thousands outside on the anniversary of Martin Luther King Jr.'s birthday, Mr. Obama spoke for 19 minutes about the ongoing American struggle for equality and justice, and the hurdles he said are preventing positive change. 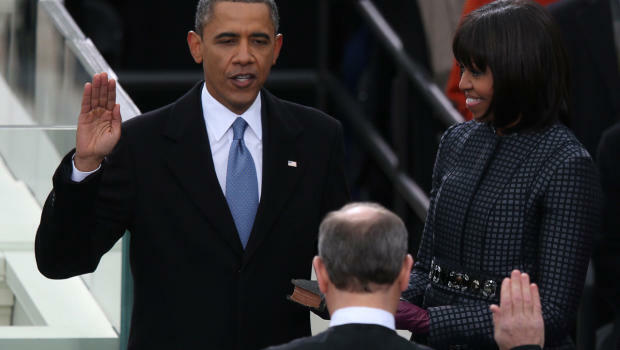 Will Obama make history with his second inaugural speech? Fidelity to the nation's founding principles, he argued, "requires new responses to new challenges." "We recall that what binds this nation together is not the colors of our skin or the tenets of our faith or the origins of our names. What makes us exceptional - what makes us American - is our allegiance to an idea, articulated in a declaration made more than two centuries ago," he said. "When times change, so must we." Reflecting on themes familiar to his first term, Mr. Obama argued that American success will remain forever incomplete while disparities between the rich and poor continue persist, and while all people are not treated as equals. He also became the first president ever to address gay rights in his inaugural address, arguing that "Our journey is not complete until our gay brothers and sisters are treated like anyone else under the law - for if we are truly created equal, then surely the love we commit to one another must be equal as well. "We, the people, declare today that the most evident of truths - that all of us are created equal - is the star that guides us still; just as it guided our forebears through Seneca Falls, and Selma, and Stonewall; just as it guided all those men and women, sung and unsung, who left footprints along this great Mall, to hear a preacher say that we cannot walk alone; to hear a King proclaim that our individual freedom is inextricably bound to the freedom of every soul on Earth," he said. "Our country cannot succeed when a shrinking few do very well and a growing many barely make it." Lightly touching on a handful of policy-oriented ideas -- from fighting climate change to improving the nation's education system -- the president outlined the many changes he believes must be made on the road to American progress. He underscored the American commitment to assisting the elderly and the impoverished, and defended the nation's entitlement programs as liberating rather than restrictive. Freedom, he argued, should not just be for "the lucky." "We recognize that no matter how responsibly we live our lives, any one of us, at any time, may face a job loss, or a sudden illness, or a home swept away in a terrible storm. The commitments we make to each other - through Medicare, and Medicaid, and Social Security - these things do not sap our initiative; they strengthen us. They do not make us a nation of takers; they free us to take the risks that make this country great." The nation's task now, he said, is to act -- "to make these words, these rights, these values of Life, and Liberty, and the Pursuit of Happiness real for every American" -- without getting bogged down in attempts to achieve perfection. "We cannot mistake absolutism for principle, or substitute spectacle for politics, or treat name-calling as reasoned debate," he said. "We must act, knowing that our work will be imperfect. We must act, knowing that today's victories will be only partial, and that it will be up to those who stand here in four years, and forty years, and four hundred years hence to advance the timeless spirit once conferred to us in a spare Philadelphia hall." That, Mr. Obama said, is "our lasting birthright." "With common effort and common purpose, with passion and dedication, let us answer the call of history," he urged, "and carry into an uncertain future that precious light of freedom."